Among his many misdeeds during Norman Osborn’s brief reign atop the global superhuman community, perhaps the most far-sighted was his constant recruitment of young heroes to mold and misshape. Osborn would use his political clout to discover and enlist these undiscovered prospects, then his charisma to convince them to see the world from his own warped perspective. Though he’s been removed from power and quarantined aboard The Raft, Norman’s recruits are still a point of concern for the reunited Avengers. Quicksilver, Tigra and Henry Pym have taken a personal interest in the reeducation of a select few: the six adolescents who make up the Avengers Academy. 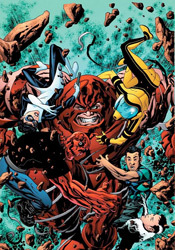 This month’s continued crossover with the Thunderbolts, and several team members’ eventual reunion with their disgraced former leader on board The Raft, leads to several revealing character moments. Osborn’s such a perfect corruptor, a politician with a background in bright spandex, that his mere presence forces both hero and reader to second-guess the line they’ve been fed from the new establishment. Christos Gage is the latest in a long list of writers to take advantage of the character’s inherently conniving, convincing nature, with nearly each chapter adding a fresh layer to the scale of the man’s mystique. The way he not only turns away a small squad dead-set on his murder but actually takes on the role of their beloved mentor, without throwing the reading audience for an eyeball-rolling loop, is all the proof you’ll need of his value as an instigator. This level of brainwashing used to require some sort of fantastic crutch, like telepathy or a mind-control wand. The modern Osborn merely needs a few words and the smallest shred of doubt to do his work. Unfortunately, Osborn is really the cornerstone of this story and once he’s out of the picture things get awfully generic in a hurry. Though Gage has a firm grasp of the megalomaniac’s bold personality, the rest of the cast feels whitewashed and redundant by comparison. Even Mettle, who gets a sympathetic mini-origin right inside the front cover, is just one of the gang without a unique angle by the time we reach the last page. Avengers Academy has set the stage for some serious questions, but hasn’t given me enough faith in its players to think they’ll ever have the balls to ask them. Joining Gage is artist Mike McKone, whose clean, organized pencils keep the page easy to navigate, if not terribly explosive. He lends the primary cast exactly the kind of wide-eyed, uncertain expressions one would expect a story’s younger contingent to be wearing. His two-panel rendition of the Man-Thing is sufficiently haunting, too, but I’m afraid the positives end there: the rest of Avengers Academy’s cast and crew generally comes off as bland, generic and flavorless. McKone’s most disappointing work appears in the one big splash page he’s given to really showcase his skills. It’s a disorganized mess: confusing and static, like a roomful of mannequins were stiffly postured and tossed haphazardly into zero gravity. It’s all composition, a poor one at that, and no emotion. This new ongoing series has some very deep roots, but at the moment they’re only being glanced at, not properly explored. The few moments we get to enjoy between Osborn and his former pages are enough to convince me there’s something substantive here, but the weak follow-through has me questioning if the Academy will ever recognize it. Keep an eye on it this space, but for the time being it’s not worth more than a brisk flip through.